Bali is one of the best island in Indonesia. There are many unique customs and traditions there, there are also many beautiful beaches. There are more than 1.000.000 people visits Bali each year, to enjoy panorama in Bali. Both local tourism and abroad tourism like Bali very much because of many reasons. People are kind in Bali. The religion in Bali dominantly is Hindu. So, there will be many cultures and traditions related Hindu will be shown wonderfully in Bali. The people are respectful and friendly, so you not to be worried to make some friends there. They will be pleased become friend with tourist. Because Bali has many beautiful beaches. People offer many Bali water sports which you can try to enjoy Bali beach panorama. You can feel the cold water in Bali beach, you can feel relax and happy to do Bali water sport. Parasailing, jet ski, banana boat, flying fish, diving are some of Bali water sport that you can do. Tanjung Benoa is the suitable beach that you can visit to try some great water sport in Bali. Tanjung Benoa is famous because of its beautiful beach and the perfect marine life in the water. There are many species of marine that you can see and enjoy under water if you are diving. Because of its rich marine species and the beauty of the beach Tanjung Benoa is very popular beach to do water sport. Do you have a plan to go to Bali and try some Bali water sport? Do you want to know more about Bali water sport? Below are the descriptions of each water sport that you can do in Bali. Check it out! Parasailing is one of the popular water sport in Bali. There are many people want to try this because this is very challenging sport. You wear a coat and then jump from the air and you will be land in beach or water. If you land in water, there are safety appliances which you can pull to make you safe in water without sinking. Parasailing is challenging sport, it is very exciting moment especially for you who wants the extreme sport. Furthermore about parasailing, the instructor of your parasailing will cancel your order if there is changing of weather.Because it can be very dangerous for your safety. Your money will refund or the time of you to do parasailing will be changed. That is based on your decision with your instructor your travel holiday agent. Banana boat is one of the interesting water sport which you can enjoy in Bali. If you are on the way to Bali, to try Banana Boat is very excited moment. Banana boat is water sport which has engine to turn on Banana Boat on the water. You will share some thrills on the wave of the water. You need to collect your team minimal 2 person or it can be more than 2 person, to ride on Banana Boat. Bali Wakeboarding is a water sport to ride a wakeboard in the water. You will feel new experience to do wakeboarding in the water. This sport is combination of snow board, water skiing, and surfing techniques. You will be guided in the water by a motor boat in speed18-24 miles per hour. And you are free to try your technique in surfing. Bali snorkeling tour is water sport to enjoy underwater of Bali sea. This sport use diving mask, a shaped tube called snorkel, and swimfins. Using all these appliances, you can observe underwater attractions which present wonderful marine life. Bali snorkeling water is one of the popular marine sport particularly at ropical resort and scuba diving locations. Enjoy snorkeling, enjoy Bali beach underwater. Grab your ticket soon to Bali, choose the best destination and traveling agent. And set your way to Bali, find Bali snorkeling tour and try it. It seems great journey in island of the God. Jet ski water sport in Bali is a sport to ride jet ski on the water. To ride jet ski is easy. Jet ski like a motorcycle which controlled by a hand powered on the right hand of throttle. If you twist the throttle, the power of the motor will be increased. And you can ride it, with pointing the front mounted-grips. Let’s enjoy riding jet ski, feel the turbulence and wave of the water, feel the gently air which touch your skin. Are you curious in natural coral which live underwater and how unique and fantastic the life in underwater of Bali sea? Trying Ocean Walker, you can see these views definitely by yourself. You just need to wear the helmet of the sea, and finally you can walk underwater. Usually you will be in the water for 30 minutes. For people who are not common in the water, it can be adapted by their condition. This Bali water sport can not be done by the people who have trouble in respiratory system and a claustrophobia problem. Enjoy the other water sport in Bali uses water ski board. You will be pulled by the power boat to surround the beautiful water sea in Bali. You can stand up and hold a tow rope tigthly and enjoy the great experience to see the panorama of Bali sea water. You will be guided by a motor boat behind your body. 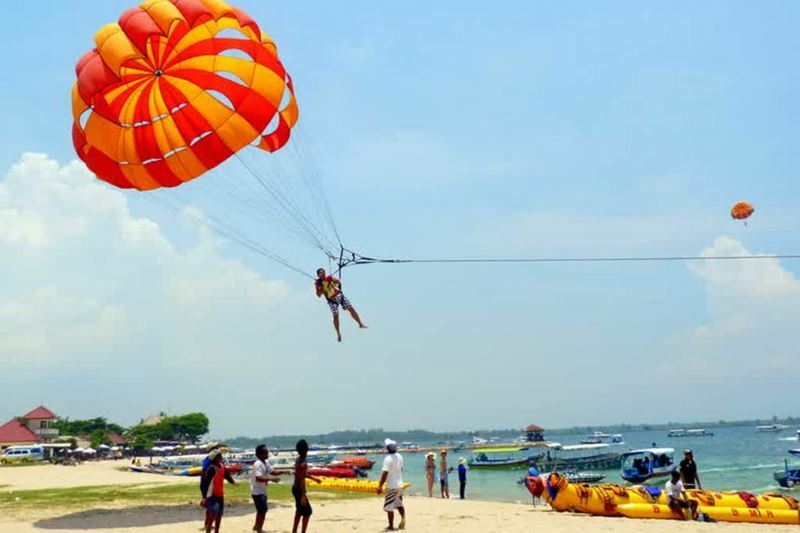 And of course, you need to be worried because the safety equipments will protect you from the dangerous thing when you try this Bali water sport. Are you ready to try Bali water ski? Do you want to enjoy the view of underwater sea in Bali. All people in the world know that Bali underwater has an interesting view. There are many kinds of fishes and corals from the smallest to the biggest kind of species. Don’t be worried, you will be guided by professional instructor to explore the underwater world. The underwater panorama of the deep blue ocean will be in front of you and feel the great experience in it. You also can enjoy the underwater life using glass bottom boat. The passengers sit on the boat which sections are from the glass. And they can enjoy underwater life and still stay in dry condition. The view of underwater through the glass bottom boat is better than looking to the water from above.This water sport is not good for they who have problem in respiratory system and claustrophobia problem. Claustrophobia problem is the fearness of the narrow room. So, for you who ar afraid of narrow room, avoid trying Bali glass bottom boat. And there are still many kinds of Bali water sport that you can enjoy if you want to explore the wonderful beach of Bali such as: Flying fish, rolling donut, new fly board and the other Bali water sports will give you the best experience to explore the world in underwater. So, let’s search the convenient travel agent tour, and try the Bali water sport that you like in Bali.